Maté recently wrote the piece “MSNBC’s Rachel Maddow Sees a ‘Russia Connection’ Lurking Around Every Corner,” which states: “MSNBC, the country’s most prominent liberal media outlet, has played a key role in stoking the frenzy over Trump’s alleged involvement with Russian meddling in the U.S. presidential race — in lock step with the Democratic Party’s most avid partisans. “And no leading media figure has done so more than Maddow. 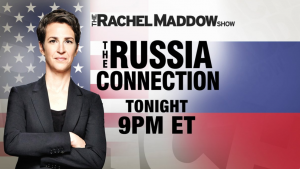 In the period since Election Day, ‘The Rachel Maddow Show’ has covered ‘The Russia Connection’ — and Russia, generally — more than it has any other issue. Maté is a producer and anchor for The Real News.